Lemniscaat was first performed in Bergen N.H. in 1983 in the hall of an old cinema that was not used anymore and which was knocked down in later years. Without any furniture or interior decoration and the wooden floor boards in full view the hall looked like a ballet studio. The screen that was still there was used for showing colour slides: eighty more or less stylised images of the manuscript of the score that was used by the musicians were shown. This series of slowly changing images was started when the tape took over the performance. The tape was a recording of previous parts of the concert. Besides the composer, who played the solo parts, the performance was given by an ensemble of four pianists. The live sections lasted between three and four hours. A kind of schedule had been devised for the total performance which was going to last for thirty hours uninterrupted. It was up to the visitor which part, or parts, were attended. In spite of the public going in and out all the time, the hall was filled with deep concentration. 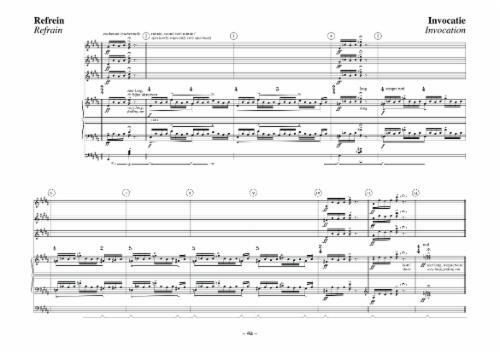 The score was a compromise between too many and too few directions, between being bound up and freedom: an open scenario. The length of the piece is undetermined, but is supported by an understanding of time in which the clock can be forgotten, the anti-stopwatch timing. Time plays an important part. The score is composed of bars or groups of bars that are provided with a repeat mark. During the performance the musicians have to decide themselves how many repeats there will be. 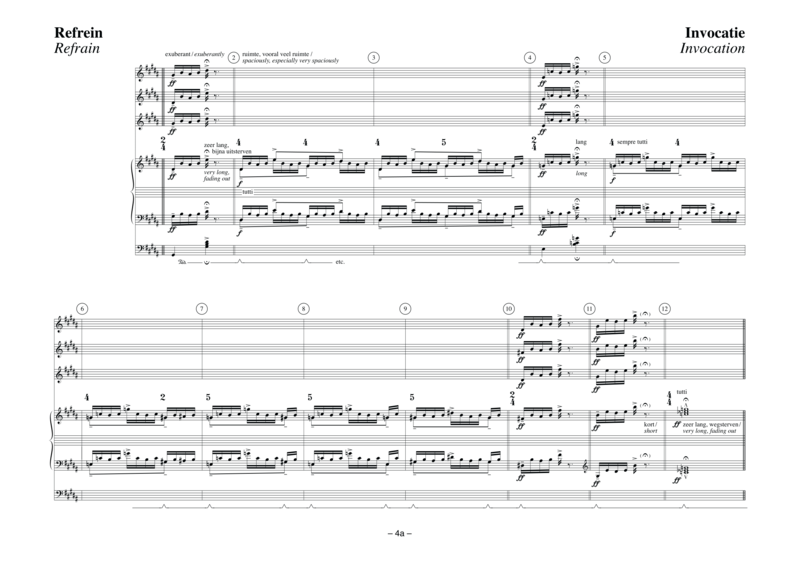 As was mentioned in the text on Canto Ostinato, which was written before Lemniscaat and which is in a way related to it, the repeat procedure aims at creating a situation in which the musical object can confirm its independence. Time changes into space, a space in which the musical object starts to hover. In this process attention is not drawn to expansion, but to the inner core of the sound. Possibilities that were never surmised by the composer and could never have been written down in a score, are likely to occur as well. Expressing the implicit potentialities occur. This process is not created from specific music-technical directions ( e.g. phase shift, minor changes in musical figuration) although these might occur, but also by the current disposition (solidarity) of the ensemble. Needless to say that this solidarity stems from a preceding period filled with empathy towards the composition. Looked upon it in this way this composition, when played by the same musicians on a certain morning may sound different in the evening of the same day. This is one of the distinguishing features of this ‘work in progress’.